There have recently been a tremendous amount of people shocked to realize the update to WordPress 3.9 and TinyMCE4 has removed the old Advanced Link button. I have been actively monitoring the WordPres.org support forums, and listening to peoples reactions. After I read numerous post topics (some nice, some quite rude).. I decided to code my own version of the Advanced Link button. This new button is compatible with the WP Edit and WP Edit Pro plugins; TinyMCE 4; and WordPress 3.9. The new button, in it’s main release, has six options for manipulating the link. 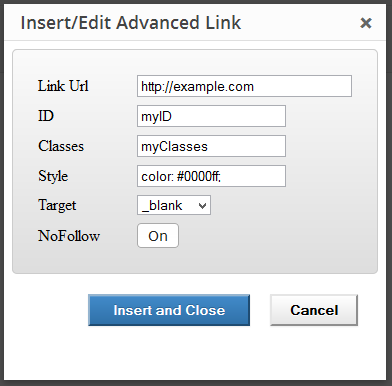 These include setting the link url, id, class, styles, target, and nofollow attributes. I believe the nofollow attribute was most requested, but I figured I’d go ahead and add the other options as some people will use them. Instead of just coding the button to insert links.. I wanted it to also be able to edit existing links. So, if you click in an existing link area and then click the Advanced Link button, the addon will populate all corresponding attributes from the editor into the modal window. This makes it easy to go back and edit existing links without having to start over from the beginning. The button is inactive when the editor loads. Only by highlighting a selection of text; or clicking inside an existing link; will the button become active. The button is coded to both insert new links; and also to edit existing links. This means, you can create a link; then go back at a later time, click anywhere inside that link; click the Advanced Link button; and the window will open pre-populated with the attributes from the active link. After creating or editing the link, click “Insert and Close” to update the link in the content editor. On the visual side, the link will reflect any of the “Styles” added in the modal window. On the ‘text’ side, the link will contain all of the proper attributes, properly coded so if WP Edit (Pro) is ever deactivated or removed; the links will not be affected. Awesome.. but Where is the Button? After updating the plugin.. you will need to click the ‘reset buttons’ button to the right of the drag and drop panel. After doing so, you will see the new button in the last position of the “Tinymce Container” area. The button tooltip while hovering over the button reads “Insert/Edit Advanced Link”. Wow – How can I Thank You? Well, there are a variety of ways. Support the developer by upgrading to WP Edit Pro, with more options and features. Donations, in any amount, are always greatly appreciated. Go over to WordPress.org and leave a Rating and Review on the WP Edit plugin. I hope everyone enjoys this new addition. I also hope some people are beginning to see these things can’t happen overnight. But with time, WP Edit (and certainly the Pro version) will become more widely accepted. If you cannot achieve this with in WP Edit Pro, is there any way you can come up with a plugin to do this, or do you know of a plugin that already does this. Is there a way to make the link open in a new tab? Hello Tracy, and thank you for your very kind support! Yes, when you open the overlay window for the advanced link… you will want to set the “Target” to “_blank”. That will cause the link you are inserting, when clicked, will open in a new browser window. “_self” will open in the same browser window. “_blank” will open in a new browser window. The other two options are there “_top” and “_parent”, but these are rarely used. We are having a problem with the link button. As noted, the button is greyed out until the text is highlighted. However, once the text is highlighted and the button comes to life, we cannot get the dialog box to open to enter the link that we want. Are we missing something? First, manually clear your browser cache. Next, use your browser inspection tool to see if you are generating an error. This WordPress Codex page can help. If you do indeed receive an error, please post over on our Support Forum. Thank you. This is great, but we badly also need the onclick functionality the former TinyMCE Advanced Link offered. The dialog should also have an alt tag and title tag option. Any chance of adding these as well? Yes, I do plan on adding more options to the Advanced Link button. I know it is not what it once was.. yet.. but I certainly intend to keep moving towards that direction. I will try to get this updated as soon as possible. I have updated but cant find any advanced link button in the editor. Neither in WP Edit config. You will need to click the “Reset Buttons” button to the right of the drag and drop editor. Please read This Part again. I actually have three websites that I have changed over to the WP Edit. I used to use the Text color button all the time to change the color of the h1, h2, etc. I was also using the Predefined Styles. I am assuming that will not even be usable anymore, correct? Also, any idea when the text color button might be available? I have no idea how to code. The Ultimate TinyMCE was a lifesaver to me. I am feeling a bit ‘naked and afraid’ right now. The text color (hex color option) is only available in my Pro version at this time. If I see another open-source color picker with hex color insertion functionality, I will consider adding it to the free version. Regarding the Predefined Styles premium addon you purchased; I am updating these as well.. and will have them available very soon. You will receive an email from me (to the email you provided when you made the purchase) with the updated version when it is ready. I’ve been so consumed with emails and forum topics, I haven’t had a chance to do much developing lately. I’ll get it completed soon!